I’m still in the throes of dissertating/preparing for my defense, so I don’t have too much to report this month. Our spending is still pretty loose. We’ll definitely have to tighten things up in a couple months when I’m without an income! Kyle and I made a really dumb money mistake this month. It definitely stems from our roles being out of whack since I’ve been working so much lately. We enjoy having our credit cards on auto-pay – that is, just before the due date, we tell the cards to pay the balance in full. In practice, these payments are never made because we pay off our cards a couple times per month. By the time the due date comes around several weeks later, we have a $0 balance and the payment isn’t made. However, one of our cards doesn’t operate this way – our Barclaycard. While we like everything else about this card, this one point is annoying. No matter what the balance on the card is at the time the payment is due, the auto-transfer is for the balance when the pay period ended. What we do is that every time we pay off the balance on this card, we then cancel the auto-payment for later that month. This is an annoying extra step, but we still want the safety net of having the auto-payment on in case we forget to make our payment. So this month, we redeemed the sign-up bonus on one of the cards. We had a $334 charge for a flight and then got a $334 credit for the redemption. When we made the redemption though, we did not cancel July’s auto-payment. There had been a $334 balance on the card for that pay period, so even though the updated balance was $0, the auto-payment transferred $334 from our checking to this credit card, giving us an excess $334 statement credit. I guess this is kind of the opposite problem that most people with credit cards get into, but ugh. I’m not sure if we could have solved this some other way, but we just decided to keep using the card until we balanced out the statement credit. So this stupid unusual auto-payment policy, which we stupidly signed up for and stupidly didn’t account for, has tricked us into using this card way more than we had planned to. You win, Barclaycard! INCOME: We received my normal grad school stipend paycheck and Kyle’s first paycheck as a postdoc, plus $187 from Kyle’s church income (divided as usual with the discretionary portion going toward our DSLR savings account). Since we use the previous month’s income in our current month’s budget, our spending this month is based on our income from June. 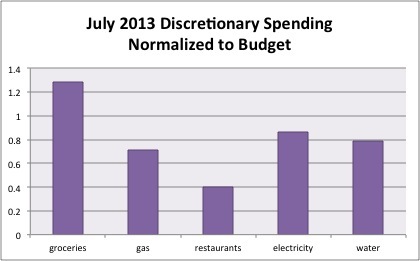 Our spending in August will be based on the income listed here. Naturally, Kyle’s net paycheck wasn’t quite was I expected it would be. It turns out I forgot about the tax that goes toward Medicaid (we haven’t paid payroll taxes since we’ve been in grad school so I don’t know about them very much) and he’s having way too much state tax withheld. I think this can be largely mitigating by Kyle changing his state withholdings – I’d much rather have cash flow right now than to get a big refund next spring. RETIREMENT SAVINGS: 18%-ish of our gross income. Groceries: It looked as though we were going to come in way, way under budget this month. I discussed last month Kyle’s impulse spending/overbuying in the grocery store now that he’s doing most of the shopping alone, but the flip side is that he shops less frequently, so that was what happened this month. At the end of the month I gave a practice defense presentation for some of our friends and we bought them pizza as a thank-you for helping me, and we put that expense in this category. Still, we were about $50 under budget, which is amazing for summer! Gas: Two fillups this month so pretty normal and slightly under budget. 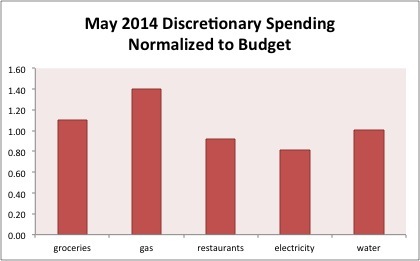 Electricity and Gas: Very slightly under budget here, which is great for summer. Water: Back under budget this month so no issues. We redeemed a credit card bonus for $53.69. Kyle realized in the airport on the way to his conference that he forgot to bring his sandals. Since he was staying in a hostel with a shared bathroom, he decided to buy some (very silly!) flip-flops in the airport for $8.53 rather than risk picking up athlete’s foot or something worse. We spent $382.89 out of these accounts and transferred $434 in above our normal savings rates. We redeemed part of Kyle’s Barclaycard bonus for $334 and transferred the money we would have used to pay it to this savings account. We paid up front for Kyle’s conference expenses from this account and are expecting a reimbursement in the next couple months. We covered most of the expenses in previous months, but in this month we paid for his lodging, transportation, and food, which totaled $280.48. Kyle spent $20 on a haircut in advance of his conference presentation. We purchased some additional memory for our desktop computer for $35 – used from eBay! We got a reimbursement from our health insurance company for $100, which we transferred to this account. We had a $47.41 bill for some tests done at a recent physical. We used our student insurance as much as was reasonable before it ended. This month and next month we’ll have our largest income ever! And then I’ll be unemployed. So for August and September we’re going to keep our everyday budget the same. The only line items we’ll change are the ones affected by our percentage-based budgeting – our tithe and our retirement savings. The portion of our giving that goes to our church will stay at 10% so its absolute value will increase for these next two months (and then drop). Kyle and I had a big argument over our new retirement savings contribution schedule, so I’ll address our final decision in a separate post in August. Mysteriously, we have $190.53 excess this month. Normally, I would dive into the numbers to figure out how we came in so far under budget, but I don’t have the time this month! If it turns out to be a mistake, I guess it will get corrected next month! Have you ever made a dumb mistake with auto-payments or credit cards? Have you had any fun this summer that I can live vicariously through? 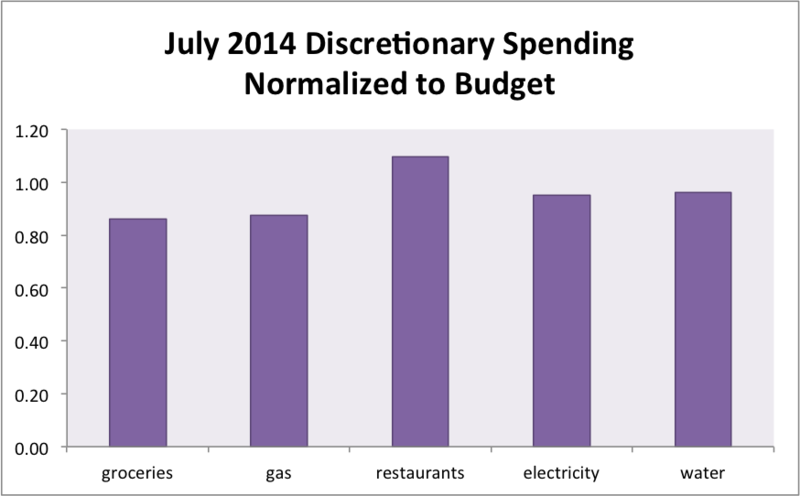 19 Responses to "July 2014 Month in Review: Money"
Congratulations on reaching your defence! Best of luck with it and congrats on being under budget for the month! It certainly was unexpected! 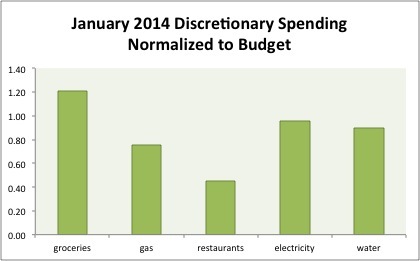 We’ve been over budget way more frequently in recent months than in past years. Yeah I hate that feature of the Barclaycard too! I’ve decided it is otherwise awesome though and I’ll keep using it. The Fidelity Amex has the same annoying feature, so one time I ended up with a $1,000 overbalance. I called them and they transferred the credit to my checking account. I assume Barclaycard would do the same. For a smaller amount though, I would just let it even out eventually since a few hundred dollars credit on a credit card isn’t the end of the world to me. I was about $600 under budget this month, partially from redeeming a ton of credit card rewards 🙂 I did something interesting this month though – I gifted money to my sibling for a course. I think it might be annoying enough to not use the autopayment feature. We haven’t forgotten to pay off our credit cards ever, so it’s not like we’re depending on it. Mint really helps in this regard to know if we have a balance on that card (we don’t use it every month). We keep forgetting to use the Barclaycard – it lives in Kyle’s wallet so I don’t automatically have it when I’m out alone – so it might take us 2 months to use up the credit! It can be hard to find the time needed to investigate spending issues when things are crazy. Just be sure to take a look at it and let us know soon! If it turns out we’re way over budget next month, I might end up attributing it to some calculation error this month, but it all will balance out since we pull/put into the same account for these budget underages/excesses. We are also expecting reimbursements from 2 sources for travel this summer that I’ve had to carry over for multiple months. I’ve tried to account for this but I may have missed a transaction here or there. Haven’t had the auto-pay overpayment problem, but have had the problem of credits on an account after we’d cancelled the card. But, the card company (American Express in this instance) mailed us a check for the difference with no fuss. Congrats on having a great July! That is great that they reimbursed you without any trouble. I’ve never had an Amex but I’m sort of afraid of them because Dave Ramsey hates them so much! Keep up the saving and being frugal. There are times it seems you are going nowhere, but once you start to hit some major financial goals it’s all worth it. I had never thought a credit card would be that bad as Barclay’s. I assume it is old technology that runs the site, and it was built so long ago that no one paid off a credit card in full back then. We recently hit a net worth milestone, which definitely made the frugal practices seem worthwhile. That’s an interesting idea about the reason for this weird autopayment feature. My first credit card has that old mindset – I wasn’t able to pay it until after the billing period ended. This is a big reason why we don’t use it anymore because we want to be able to pay the card off in the same month we make the purchases to keep our budget consistent. I think Barclaycard might just want to make users like us make mistakes so we keep using the card! Otherwise we would have just gotten the bonus and gone back to using our base card. Best of luck finishing and defending your work! I just sat for my exams last week and it’s so strange (but awesome) to have free time once again. Congratulations on being done with exams! I have had a bit of free time in the last week but I can’t wait for the stress to be over. Even if I have had time to socialize or do something fun I haven’t allowed myself because I could be working. It’s really sucked to miss the summer but it’s nearly over. Are you finished with your degree or do you have another semester or two? Yes, Kyle was in Boston and had to get his Mike’s Pastry fix. 🙂 He corrected me that he actually bought one cannoli and one eclair. Good luck Emily! Get ‘er done! Alicia recently posted..Financial Update: July 2014. Thanks! Things are going fine. I’ve been setting deadlines for myself far enough in advance of the real ones so that is helping a lot when I fall behind schedule at the end. Only one half-nighter so far and no plans for another. I was recently told based on a personality/aptitude test that I’m fairly disconnected from my feelings, so that is really coming in handy. 🙂 Kyle’s also been a big big help both with the household and giving me constructive criticism. Home stretch now! Haha no I accounted for the cc overpayment in the end-of-month balance, so it’s just the $180 excess. Nope, it was a pretty good month. I just wish I had more time for analysis(/obsessing)! Hi Emily, I’ve been always a fan of keeping track on what things we spend our money with. Knowing where money goes and making comparisons are something everybody should do. More than that, turning the people we are with from spender to saver is really challenging that we come up with tactics on how to properly do it without ending up with a conflict. How do you encourage Kyle stop overspending? Kyle is actually a saver as well and doesn’t typically overspend. He just doesn’t stick to the grocery list! It’s not a battle worth waging in our marriage IMO. I’m just happy he’s been doing the shopping.